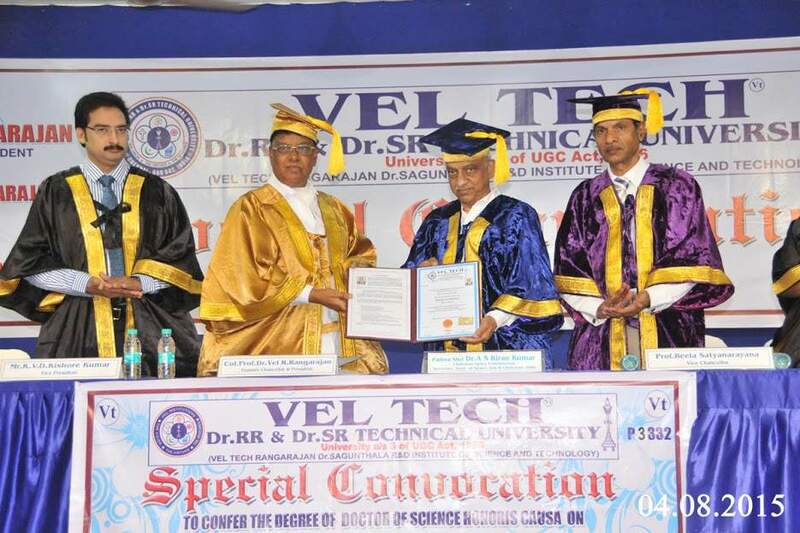 The University Confers Honorary Doctor of Science on Padma Shri Dr.A.S.Kiran Kumar , Chairman , Space Commission , Secretary ,Dept of Space , GOI, & Chairman ISRO at Special Convocation held on 4 th August at the University Auditorium. In his acceptance speech Dr.A.S.Kiran Kumar, appreciated the team work efforts at ISRO, the reason for its tremendous success. He also said that on interacting with the research faculty of the university it was heartening to know that in our country there are people who are putting their heart and soul for new ideas and are bringing the industry, international organizations and academia together. He acknowledged that it is worth disseminating what this University is doing. He also advised the student engineer that process of learning and unlearning are equally important to adopt to new technologies and he advised the youngsters to see the nature and to conceive many ideas from nature which will make us to think more how to adopt it and implement . 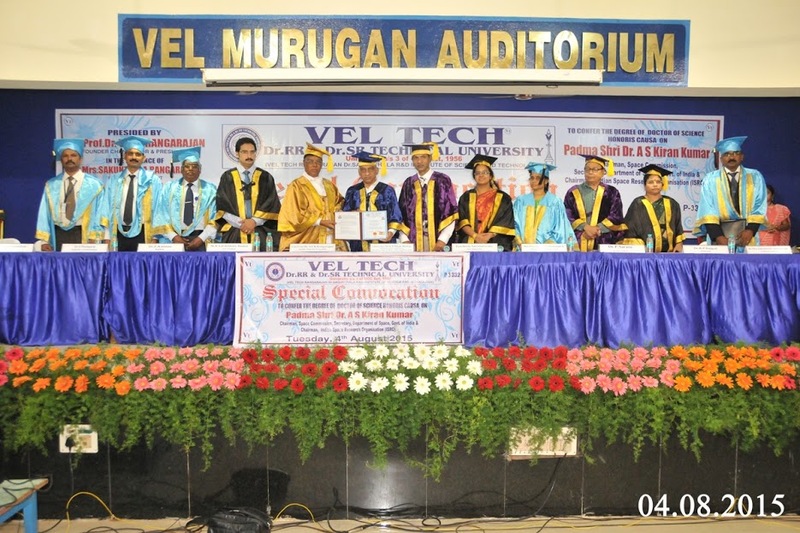 Founder President Dr.R.Rangarajan , Chancellor Dr.R.P.Bajpai , Vice Chancellor Dr.Beela Satyanarayana , members of the Board of Management took part in the noble occasion. Dr.Kiran Kumar also visited the Research Park, Knowledge resource centre, E waste Facility and Special labs of the University, augmented rare honour and humble privilege for the University students to interact with this great visionary , innovator and highly accomplished dignita who inspite of his extremely busy schedule and security reasons spent a good time interacting with the students and faculty of the University. He is the Chairman, Space Commission, Secretary, Department of Space, Govt. of India & Chairman, Indian Space Research Organization (ISRO). Alur Seelin Kiran Kumar received his Physics (Honours) Degree from National College, Bangalore University in 1971. He obtained his Masters Degree in Electronics from Bangalore University in 1973 and thereafter M.Tech Degree in Physical Engineering from Indian Institute of Science (Bangalore) in 1975. Shri Kiran Kumar joined Indian Space Research Organisation (ISRO) in 1975 and has contributed to electro optical imaging payload development activities at the Space Applications Centre (SAC), Ahmedabad, of progressively increasing complexity starting from a moderate one kilometer resolution BHASKARA TV payload (1979) to ONE meter high resolution TES payload (2001). >> Ocean Color Monitor payload of Oceansat-1 and -2. >> Very High Resolution Radiometers (VHRR) payloads for geostationary satellites. >> Imaging payloads for Resource sat series, Cartosat series and Indian Mini Satellite series. Shri Kiran Kumar has played a key role in design and development of the Terrain Mapping Camera and Hyper spectral Imager payloads of Chandrayaan-1 – India’s first mission to Moon. As Deputy Director of Sensors Development Area at Space Applications Centre, he has steered the design and development of imaging payloads for INSAT–3D mission, Resourcesat, Cartosat and Micro Satellite missions. He is a highly accomplished space scientist and engineer with a distinguished career spanning over four decades in ISRO in the satellite payload and applications domains. He assumed the office of the Secretary, Department of Space, Chairman, Space Commission and Chairman, Indian Space Research Organisation (ISRO) from January 14, 2015. >> Fellow of Indian Meteorological Society. 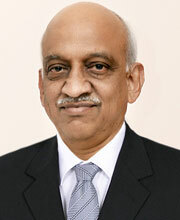 Shri Kiran Kumar is recipient of many laurels/awards like – >> Indian Society of Remote Sensing Award for the year 1994. >> VASVIK Award (Electronic sciences and technology) for the year 1998. >> Astronautical Society of India Award (Space sciences and Applications) for the year 2001. >> ISRO Individual Service Award 2006. >> Bhaskara Award conferred by Indian Society of Remote Sensing for the year 2007. >> ISRO Performance Excellence Award 2008. He has represented ISRO in international forums like World Meteorological Organisation (WMO), Committee on Earth Observation Satellites (CEOS) and Indo-US Joint Working Group on Civil Space Cooperation.